1. ride for pleasure, typically without a definite route. 2. talk or write at length in a confused or inconsequential way. "he rambled on about his bike racing career"
1. a ride taken for pleasure, especially in the countryside. 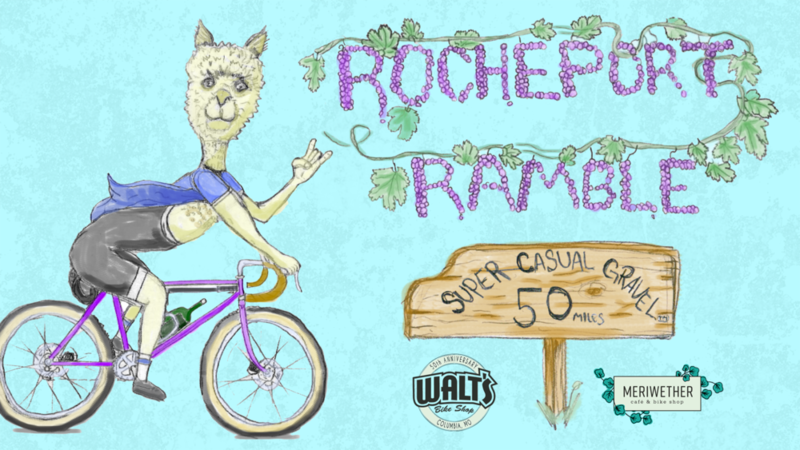 The Rocheport Ramble is a casual, self-supported gravel ride on July 8 starting at Walt's Bike Shop then heading out to Meriwether Cafe & Bike Shop in Rocheport for lunch and drinks before heading back again. Riders are simply encouraged to start at 9:00am and follow the route suggested, though those that deviate from our proposed plans certainly won't be punished. Prefer to ride the Katy Trail the entire way? Great. Our planned 50 mile route tours some of our favorite gravel roads north of I-70 then returns on the Katy and MKT trails. The roads on the first half of the loop are hilly and segments can have thick and chunky gravel. Some sort of gravel or touring bike with wider tires is recommended, though the "run whatcha brung" mentality is always respected. Be advised, this ride is a completely and utterly self-supported event and riders should be prepared as such. However, should the need arise, cyclists tend to be a friendly bunch, so any mechanical or emotional problems can likely be remedied. As is the nature of group rides, paces will vary and groups will form. See someone riding by themselves? Invite them along. You never know what kind of treats might be hiding in their basket bag. Also, it's free. Stay up to date and RSVP here.